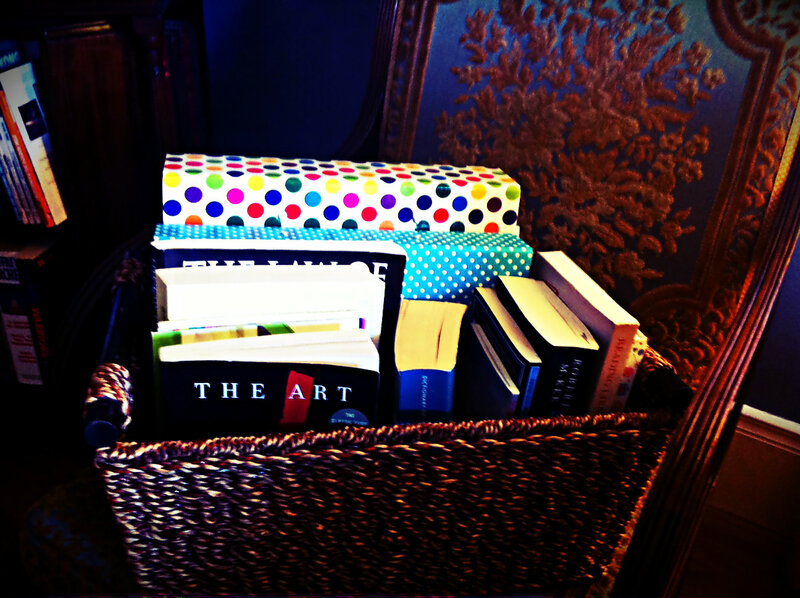 This is my novel writing ‘book-basket’ and it travels with me everywhere I go. I have been lugging it about from house to house, desk to desk and room to room for over six months, carrying about the books I refer to on an almost daily basis as I go about my fiction writing. There are plenty more books in my ever-growing home library, from which I select a new fiction novel to read and it then goes in the ‘book basket’ with the other reference books. The spotty folders at the back of the basket are my printed out manuscript drafts (one & two), as I like to have these with me at all times too. So here is the list of books I carry about in my novel writing ‘book-basket’. There are other writing reference books I should also have as a writer, such as Artful Sentences by Virginia Tufte – however the above list is the books I have ended up with. The two books the helped most when I was trying to figure out what I was writing about were Story by Robert McKee and The Art of Dramatic Writing by Egri. McKee’s principle of the ‘controlling idea’ and Egri’s dealing of the principle of ‘unity of opposites’ really helped me to clarify the themes and conflicts I was writing about and how best to make them work on paper. I flick into these two books more than once a day and always find something new to help me along. For now, I am still editing my second draft manuscript with the help of all the above, so lets hope I can translate what I read and learn onto my own writing paper. When I began writing full-time, just over a year ago, my writing routine was simple. 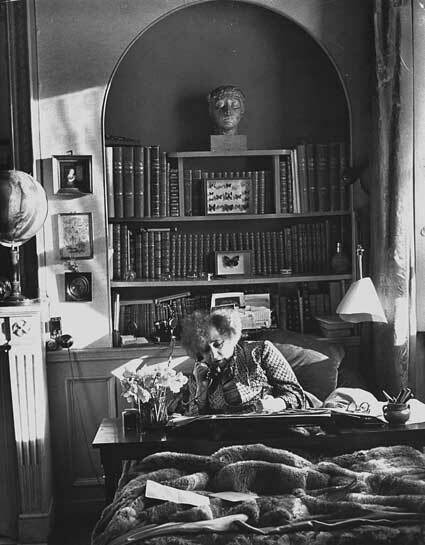 I wrote – non-stop, all day every day – sometimes for twelve or fourteen hours straight. For four months the all-consuming story inside me pushed all other tasks and thoughts into a ‘rain check’ file at the back of my mind. I couldn’t think of anything else because my story wouldn’t allow me to – it was determined to force itself out from my conscience and down through the tips of my fingers on to blank sheets of paper. But you can’t write like that forever. A year on, although my writing routine is less compressed, I still haven’t found the best workable routine for writing and life. Before I start to write, it takes me about 3 hours of faffing about before I can clear my head and focus properly. My daily life task list must be completed – if I know I have to break for something at 4 pm, I am distracted by that fact until then. I absolutely have to be alone – no distractions, no company, zero noise. And once I start writing, I find it very hard to stop if I’m on a roll. In a nutshell, it takes me hours to focus and then I find it very difficult to switch off. I often find myself writing furiously at 3 am or even later – developing thoughts and ideas that are swirling around the ether of my writing room. I’m unwilling to step away in case I lose where I’m going, or waste a positive creative flow and squander all the good vibrations. I’m so exhausted by the time I get to bed that my head is foggy in the morning and my new day starts later, and my writing even later. Before long, my days are backwards as I am living and writing solely at night-time – at odds with the rest of society. I seem to be at the mercy of my idiosyncrasies and the fact that my creativity regularly waxes into something worth writing about in the dead of darkness as the whole world sleeps. So what is the most functional writer’s routine? I’ve read that a lot of writer’s work on a ‘day job’ schedule – but how do they stop the flow of words at a certain time of day? If I’m trying to stick to a sustainable writing routine, how do I control and contain my idiosyncrasies and the timing of those flashing streaks of creative inspiration that often take me into the dead of the night? 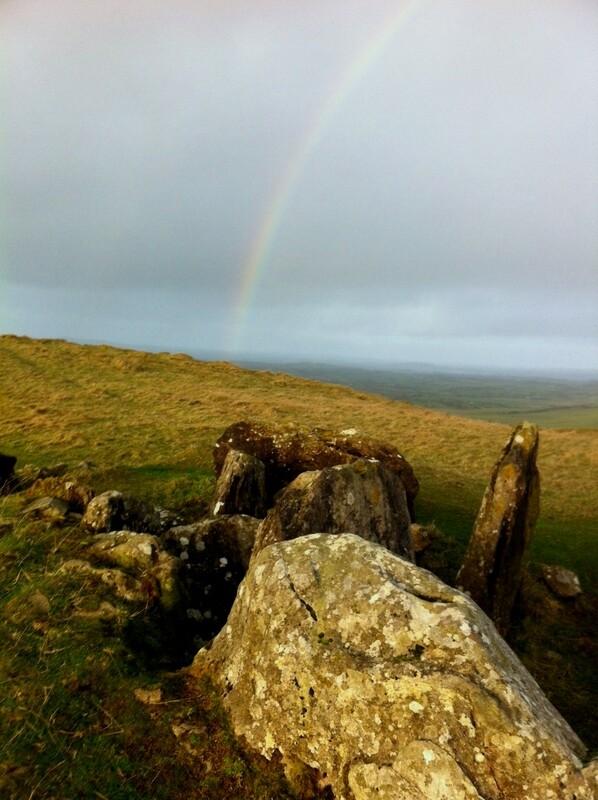 This is where I spent the afternoon of New years Day 2013 – Loughcrew, Co. Meath. I needed some inspiration to push me through the phase II editing on my novel’s manuscript. It had been a tough few weeks and I was experiencing some sort of ‘creativity block’. I needed to see clearly and far into the distance, so I climbing to the top of the old megalithic passage grave at Loughcrew – which is over 5,000 years old. Far below me, the beautiful Meath countryside swept around for miles and miles from the breathtaking 360 degree view point. The wind swiftly grabbed the cobwebs from my head and the awe-inspiring view opened my mind and eyes into the distance, shifting my internal visual perspective. I just wasn’t expecting to see this beautiful inspirational rainbow in the untouchable distance! I managed to capture it on camera before it lost its tenuous grasp on the January air and faded away into the misty afternoon. I couldn’t have wished for better. I returned home that evening invigorated and refreshed – and totally enchanted by the rainbow. It was the perfect ray of hope to encourage me to keep going, to get over the hurdles I had hit with my writing and to have trust in what I was doing. I rejigged my writing timetable, clearly setting out the targets I needed to achieve in the coming weeks. And guess what, it worked. I have completed my plot and scene restructure, editing all my scenes into a more compelling story so that they drive my plot and characters forward. Let the stage II rewriting begin. Thank you for the inspiration Mother Nature!